Jonathon Jennings tossed a 22-yard touchdown pass to Bryan Burnham midway through the third quarter and the BC Lions got two touchdowns from their defence en route to a 34 -21 victory over the Winnipeg Blue Bombers on Friday night at BC Place. Defensive lineman Odell Willis made a perfect first impression in his first home game as a Lion, taking a fumble to the house in the game’s opening series to give the home team an early lead. Winnipeg’s Felix Menard-Briere then cut the lead in half with a field goal, with Lions kicker Ty Long responding with three points of his own. Prior to halftime, Bombers wide receiver Reuben Randle took advantage of a man-to-man match-up and caught a 58-yard jump ball touchdown pass from Bryan Bennett to cut Winnipeg’s deficit to one. 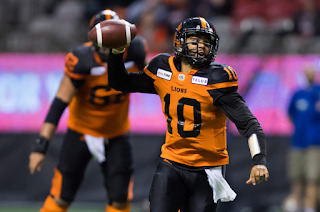 Jennings and the rest of the Lions’ first-team offence started the third quarter, scoring midway through on Burnham’s first catch of the game. 55 seconds later, Lions defensive back Otha Foster picked off a Chris Streveler pass, taking it 62 yards for the touchdown. The Lions added a one-yard run by backup quarterback Ricky Lloyd to extend their lead to 19. The Bombers got a touchdown late in the fourth quarter, a 32-yard score by Kenbrell Thompkins from Streveler. With incumbent starter Matt Nichols out several weeks with a knee injury, the Bombers entered tonight’s game with major question marks at quarterback. They used four signal-callers on the evening, with starter Alex Ross going 10 for 13 versus his former team, while Streveler was 3 for 9 with an interception. The Bombers’ run game was ineffective, accumulating just 57 combined yards on the evening. On the other side of the field, the Lions’ first-team offence looked sharp in its three quarters of action. Jennings was crisp and methodical with the ball, completing 17 of 24 passes for 182 yards and a touchdown. Backup Ricky Lloyd went 7 for 11, scoring a rushing touchdown. Across the board, the Lions out-gained their West Division rivals. BC had 22 first downs to Winnipeg’s 13, including 12 in the air. Winnipeg’s four quarterbacks combined for just five passing first downs on the evening. Neither team was particularly disciplined, with both teams combining for 21 penalties and 241 lost yards. The Lions had two long punt returns by running back Chris Rainey called back thanks to holding calls. Veteran Lions receiver Emmanuel Arceneaux led all receivers with six receptions for 72 yards, while Randle paced the Blue Bombers with 63 receiving yards. Next up for the Blue Bombers is a regular season clash with the Edmonton Eskimos on Thursday, while the Lions host Montreal next Saturday in their home opener.